Heat oil in a pan and add the garlic and stir fry for a minute. Add the diced onions, carrots, potatoes and red pepper and cook for 3 mins. Add the mince meat to the vegetables and cook until lightly browned. Add diced tomatoes, chilli powder, chicken cube, soya sauce ,salt and pepper and cook with the meat and vegetables for 5 mins. Mince meat tends to cook very quickly. In one cup of water, mix the cornflour. Add the tomato sauce and 1 tbsp of soya sauce to this mix, stir and pour it into the mince meat. Cook for 2-3 minutes till the sauce thickens. Add the baked beans to the meat sauce and cook for 2-3 mins. Adjust seasonings as per taste. Cook the pasta in hot water as per the instructions given on the package. Drain and set aside. 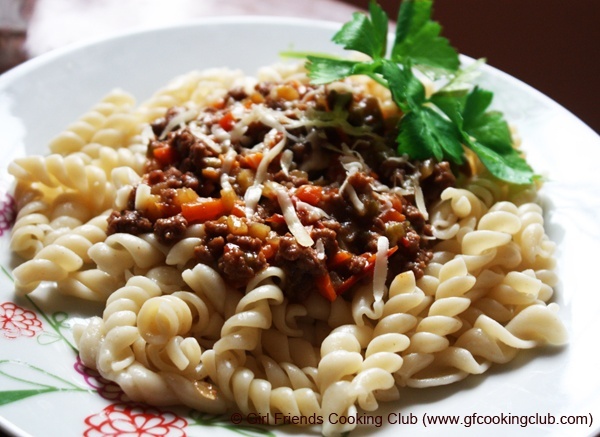 Serve pasta, topped with the meat sauce, shredded cheese and celery. This entry was posted in All Recipes, Chicken, Mutton, Pasta, Pork and tagged Meat Sauce with Pasta by Kamakshi. Bookmark the permalink.